You can get qualified to win the Qcountry Mega Ticket each weekday when you win a qualifying prize with Gas Math before 9, 2, and 7! 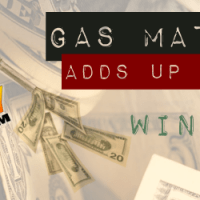 You can also get extra chances at winning the Mega Ticket by entering the Gas Math price that Brad King gives out each weekday morning at 7:40 am. If you would like to have one time and answer for Gas Math sent to your phone each day. Sign up your cell phone number below.